Resicast is world famous for its production of British vehicle kits, conversion sets and figures in 1/35 scale. The quality of their products, as many will know, are quite simply outstanding, and the company produces many unique items unavailable elsewhere. This latest release follows what one would expect from the company: a rather unique set of sleeping British infantry sculpted by Gerard Detroeve. The figures are designed to compliment the Bren or Scout Carrier that Resicast has devoted many sets to, and depict 3 soldiers taking a "kip" in a vehicle. 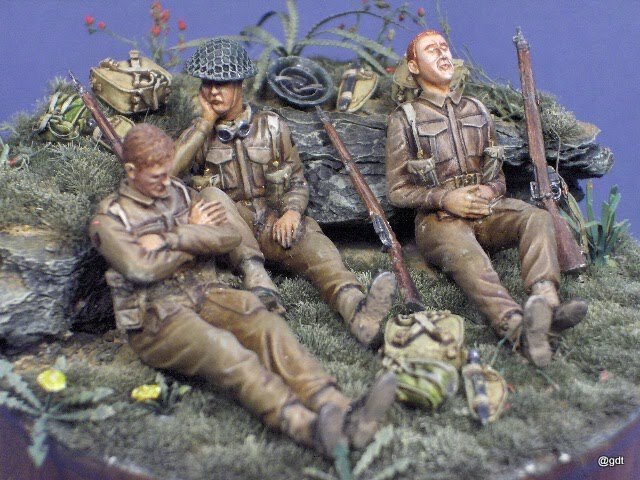 Following the recent introduction of some early war figures, this new three-figure set depicts 3 soldiers of the British Expeditionary Force in France catching up on some rest. Those with service experience will know the value of sleep when on active duty, and I’d say most soldiers could sleep just about anywhere, at anytime given the chance, and one doesn’t have to be stationary to achieve that! Soldiers catching a few ‘Zzzzzzzzs’ would have been a common sight during this period. The Battle for France, once it commenced on 10th May 1940, although short in duration, was a fast-moving conflict, with the British being forced back to Dunkirk, followed by the subsequent evacuation, with the final armistice being signed by France on June 22, 1940. The set comes packed in the standard Resicast format, with the figures zip bagged individually, and then zipped up in a larger bag with the appropriate product information and manufacturer's details. A painting guide is included in a small card insert. Cast in a light grey resin, the figures are of simple construction, having complete bodies with only the heads and in one case an arm to add. The quality of the sculpting and casting appears excellent. All the figures are dressed in Battle Dress Serge 1939/40 with good uniform detail, and are equipped with skeleton webbing. All are moulded in a seated, relaxed position with legs extended. Nice natural folds and creases are evident in all the uniform detail, so these should paint up really well. The figure consists of 3 parts: whole body, head and right arm as separate items. As mentioned above, the figure is dressed in BD, and this is nicely-depicted with the blouse having the pleated pockets, and all other elements being present and correct. The webbing is of the early style, with the slightly wider and lower ammo pouches, buckles and brasses; these are also well-done, although the buckles on the rear of the belt are absent. But as the figure is designed to fit the carrier driver's space, these are not required. Around the driver's neck are a pair of goggles. A good pair of ammo boots and anklets complete the basic dress. The head comes with the hand moulded to it, since the right arm is designed to rest on the edge of the carrier with the soldier's head resting on his right hand. The facial detail is good, clearly representing a sleeping soldier. I tested the figure inside a carrier, and it fits well and looks the part. The vehicle commander is a two-part figure with whole body and only the head to add. The arms are moulded to the figure resting across his stomach. Dressed as per the driver, less goggles, but with the buckles on the rear of the belt, this is another nicely-sculpted individual. Again, I tested the fit in a carrier, and with his head added and tilted back and the legs extended, he, too, looks the part of a sleeping Tommy. The third and final figure is a plain crewman, again kitted-out as per the driver and commander. A simple figure of whole body and separate head, this time his arms are crossed over the chest, upper torso bent slightly forward. The head is designed to nod forward in the act of sleeping. Again facial detail is good and appropriate, and a test-fitting looked the part in the back of the carrier. These are a very useful set of figures to populate the carrier, as well as depicting a common sight in any army. The sculpting is excellent, and the body proportions are very acceptable. The figures naturally have been made to fit the carrier, and are therefore a little thinner than normal. You get a choice of helmet-less or helmeted heads to match each figure, so options there. The poses look quite natural to me, and could even be used in other locations or vehicles, so again lots of choices there. If I have an observation, it would be on the need for a slightly more-varied hair style or more hair on the head of at least one of the heads. These figures are also to be available as separate items, and have been remoulded to depict troops in NWE post-Dunkirk. Those versions come with additional No 4 rifles, short stabbing bayonets, gasmask, haversack, small digging tool and a separate small back haversack with detail on the front and rear. Two heads are also included for these separate figures, one with and one without helmet, plus a separate early Mk II helmet with liner. These are featured below the review. So lots of choices coming from this set, which should be of particular interest to both model makers and figure painters alike. They certainly provide an interesting and natural element to add your build, one that was previously unavailable. Highs: Excellent sculpting and casting, a very unique set. Sorry, Al. I was trying to jump in while James is quite busy and not wait for orders, so to speak. Isn't there a line from some British war movie about how "All initiative in subalterns will be rigorously rooted out"? That's partly true: Stalingrad Figures is also offering both German & Russian soldiers at rest. In any case, it's worth a bump.